Now isn't this a nifty idea! 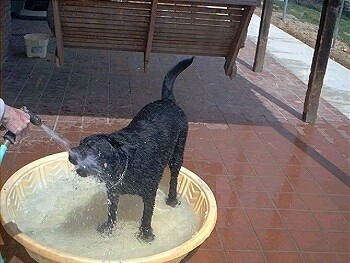 For those dogs that enjoy the hose, wrap the hose around a clothesline and set the dogs loose for some water fun. They are not only keeping cool, but getting a good workout at the same time. This is Cowboy and Matty. Cowboy is believed to be either a Pit Bull or a Staffy, and Matty is believed to be a Lab/Setter mix. See another picture of Cowboy and Matty: Those Amazing Dogs 39! You can tell Cowboy is the dog who gets totally excited over the hose. Matty is excited because Cowboy is excited. 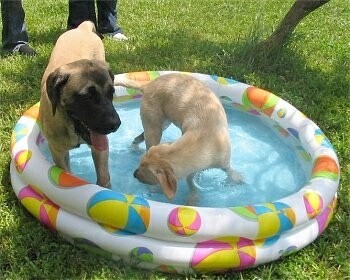 Both dogs are having a fabulous time, and keeping cool! Looks like Cowboy has just landed from one of his leaping jumps! 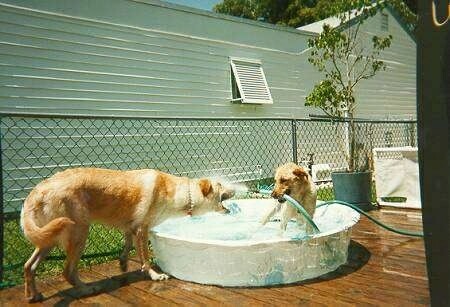 Shaggy the Golden Retriever cooling off in the pool while his German Shepherd buddy takes a cool drink. 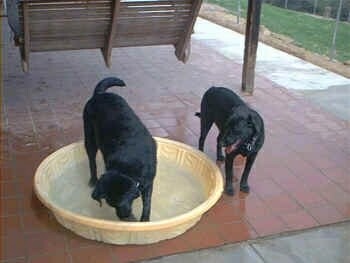 Black Labrador Retrievers beating the heat in their little splash pool. 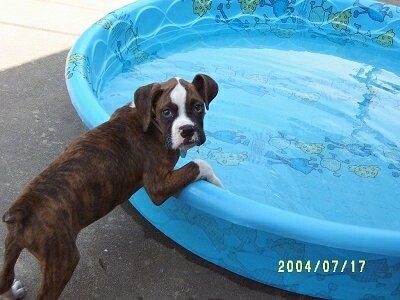 Rocky the Boxer Pup knows how to Beat the Heat in his big kitty pool!